Garrett County, home to Lake Pointe Inn, is known for its beauty and its history. The two interconnect in the story of John Work Garrett, who became the namesake of Garrett County when it was established in 1872. At that time, Garrett was President of the Baltimore and Ohio (B&O) Railroad and was traveling frequently from Baltimore to Ohio conducting important meetings with the likes of Abraham Lincoln. During one of Garrett’s trips, he stopped in a small town in western Maryland. He loved the landscape and built a cottage there. The small tract of land in Maryland ultimately split from Allegheny County and was named Garrett County in honor of John Work Garrett’s contributions to the area. The story of John Work Garrett and other historically significant narratives come to life in Garrett County thanks to the Garrett County Historical Society. The historical society aims to represent and chronicle the complex past of Garrett County by collecting and housing artifacts, books, records and other historical materials in three local museums. These three museums, known as the Garrett County Historical Society Museums, include the Historical Museum, the Transportation Museum and the Grantsville Museum. Each museum offers its own array of displays and presentations playing homage to Garrett County’s past. For history and genealogy buffs, we strongly recommend a visit to at least one of these three Garrett County Historical Society Museums during your stay with us at Lake Pointe Inn. At the Garrett County Historical Museum, you can step back in time to experience the way of life for Garrett County citizens from years past. Friendly volunteers will help you navigate through a variety of artifacts that will immerse you in a world of changing culture. 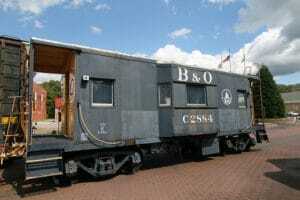 You’ll even get to see a replica of a B&O train that was featured in the Chicago World’s Fair in 1893. With nine rooms each showcasing a different era, the Garrett County Historical Museum has something fun for every member of your family. The Garrett County Historical Museum address is 107 S. 2nd St., Oakland, MD 21550. Get up close and personal with vintage carriages, sleighs, buggies, fire department artifacts, automobiles and more at the Garrett County Transportation Museum. Check out an original Garrett County sailboat, Garrett County’s first snowmobile and the ever popular Buddy L Model T Fords. Also featured in the transportation museum are exhibits about the history of Deep Creek Lake and nearby Maryland State Parks. The Garrett County Museum of Transportation is located on E. Liberty St., Oakland, MD 21550 next to the Garrett County Historical Museum. Explore the compelling story of Grantsville and Western Maryland through a collection of photographs and artifacts donated by the greater Grantsville community. The primary exhibit at the Grantsville Community Museum features photographs from poet and photographer Leo Beachy, who chronicled the history of Grantsville from 1905 to 1927. The Grantsville Community Museum address is 153 Main Street, Grantsville, MD 21536. After visiting one or more of these fine Garrett County Historical Society Museums, you will enjoy returning to Lake Pointe Inn to put your feet up and reflect on all that you’ve learned. During our warm weather months, sit back in an Adirondack chair overlooking the lake and ponder your ancestors’ involvement with the B&O Railroad, or in the winter, cozy up to your in-room fireplace and count your blessings for electric heating. We’ll provide complimentary refreshments and all the modern conveniences you’ll need for a pleasant stay. Plan your visit to Garrett County today! Photo courtesy of John Mueller.